Yesterday, the GER3 team successfully recovered 9 classrooms at the Leonard Connor School. Working in partnership with Tzu Chi, GER3 provided technical guidance, supervision and supplies, while Tzu Chi provided volunteers and food/water. As a result of GER3's intervention, the teachers and workers will now have access to their classrooms to prepare for reopening next Monday. In addition, the Ministry of Education was able to send contractors to the school to start repairing windows, something it was unable to do before due to access issues. Today the team will focus on a household, previously identified by GER3, that is in desperate need of debris removal. The residents are elderly and handicapped, and have remained in their home amongst the debris with only a partial roof. GER3 will work with Tzu Chi to remove the debris from the house and restore their home as quickly as possible. GER3 conducted several rapid assessments, attended insightful shelter meetings, and is now working with communities to identify greatest needs. Yesterday, the team worked closely with the Tzu Chi foundation Sint Maarten, distributing food in the Sucker Garden community. Today they will be clearing debris at the Leonard Connor School in Cay Bay, in hopes of reopening the school on October 2nd. A two-person GER3 team headed from Curaçao to Sint Maarten this morning to immediately begin assessments. After receiving insight from Netherlands Red Cross members on current relief efforts, the GER3 team will arrive prepared to hit the ground running. They will attend their first coordination meeting tonight. More updates to come. A two-person team will be deploying to Sint Maarten this Friday, September 15th to assess damages from Hurricane Irma and how GER can best plug into relief efforts. The team is expected to arrive in Simpson Bay around 1:00pm on Friday with all the kit required to immediately begin work assessing the situation on the Caribbean island. 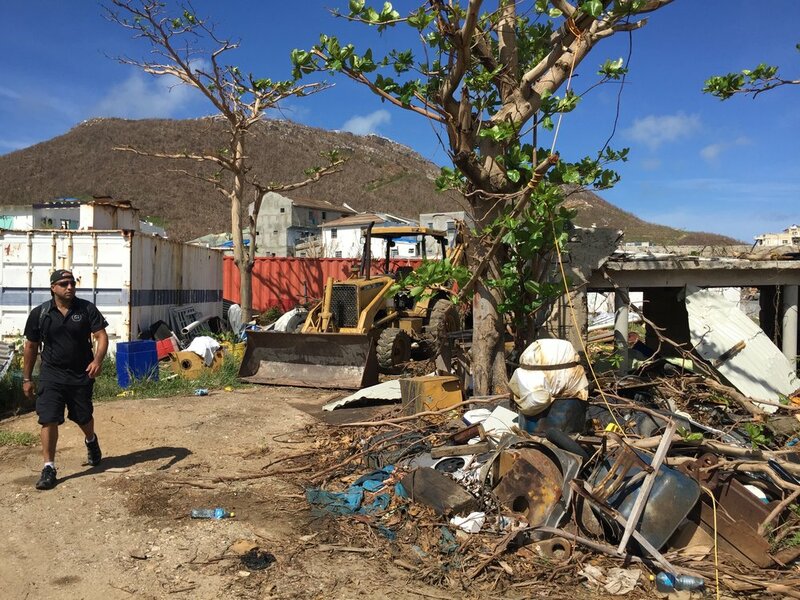 If you are interested in partnering with GER3 on this operation or have any questions about the deployment, please reach out to GER3 CEO Steve McAndrew at steve.mcandrew@ger3.org or Sint Maarten assessment Team Leader Brennan Banks at brennan.banks@ger3.org. GER is monitoring the current emergency situations in the Caribbean, US and Mexico. For Hurricane Irma, GER has standby teams prepared for deployment to the Caribbean, Bahamas and Haiti and also has staff in Florida at this time. In response to the Chiapas Earthquake in southern Mexico, GER has activated team members from its Spanish-speaking roster of emergency responders, including programmanagers and assessment specialists. GER has also been in touch with partners to share current planning, including Engineers Without Borders and donors who are interested in the various affected countries and areas. Further updates will be shared in the coming days. GER3 is responding to Hurricane Harvey in Houston. A GER3 response team is on the ground with vehicles, boats, equipment and supplies for affected families. The GER3 team is working directly with families in the metropolitan Houston area. GER3 has been supporting families starting the recovery process and putting their lives back together. Support includes the provision cleaning kits for families to help return to their homes after flood waters have receded. GER3 cleaning kits contain various items to help families clean up and disinfect homes upon return. The kits contain several pairs of rubber gloves for protection while cleaning, a strong push broom, a string mop for heavy cleaning and a sponge mop for cleaning finished floods. Further items include a large trash can, a bucket, rags, sponges and chlorine. Chlorine is one of the most important items as the cleaning of disease-carrying residue and dust can still be dangerous, especially for young children. The kits also provide large, heavy-duty trash bags and masks for further protection. The cleaning kits are being used together with GER3 volunteers in debris removal from homes. Homeowners are overwhelmed in removing ruined clothing, photos, furniture and extensive belongings that have been destroyed in the flooding. 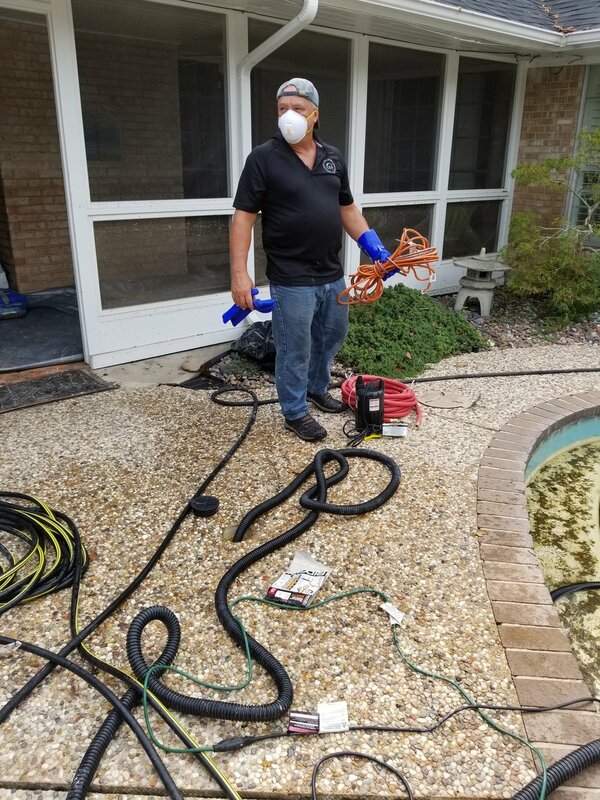 GER3 has also been providing water pumping services to help families in flooded houses lower and remove standing and contaminated water, which is a creating a serious health concern as mosquitos are breeding other sicknesses are developing in the standing pools. Some houses have swimming pools which are now dangerous vector breeding grounds, and also low lying areas and rooms where contaminated floods waters are still lingering. GER3 has also been working with some families to help in the identification, treatment and remediation of mold. Mold is now presenting a significant challenge to families returning home after flooding. Although water has resided, mold is now found behind drywall, in foundations and floors of homes. GER3 is supporting families to test for mold, identify solutions, and make decisions on repairs and return timeframes. The support involves coordinating and covering costs for local mold testing specialists to review homes, provide expert opinions on when and what items to remove or repair further before moving back in. Lastly, GER3 has been providing some cash grants to families, giving them the power of decision making and prioritizing their needs, such as food, medicine, school supplies, toys or any other immediate needs. The GER3 response to Hurricane Harvey provides families with the comfort that they are not alone and that there are people, including our donors, who care and will work together, shoulder to shoulder, in these difficult times. As in all actions of help, the benefits go far beyond kits, supplies and services, to demonstrate the higher qualities of humanity and human cooperation among all persons. GER3 is responding immediately to Hurricane Harvey with the deployment of an initial response team consisting of three assessment and programming specialists. The GER3 team is mobilizing with our vehicles and will be fully self-sufficient with the equipment (tents, food supplies, electrical supply, telecommunications equipment and three boats so we can access communities affected by Harvey) needed to be immediately operational in the affected area. The GER3 team will be augmented as needed with other disaster response specialists and begin to identify ways in which GER3 can support the relief, recovery and reconstruction efforts. The team will meet this week with local and national emergency management officials (FEMA), the American Red Cross and other partners operating in the area to identify potential communities most in need of our support. We will then work with affected communities to understand how to best leverage the GER3 "build back, better" approach to meet needs given available resources. We will seek to respond with assistance that is needed now and then link that assistance to longer-term recovery and reconstruction support. As with all GER3 operations we will seek to use sustainable supplies, recycle available materials and respond based on what the community actually tells us that they need. We will focus on clearing the debris left by Harvey, providing temporary facilities and immediately starting the reconstruction process with a particular focus on homes, schools and health facilities. Our response is strengthened through our partnerships withothers. We will partner with the communities, other organizations and with those who can support GER3 with resources. At this time, all donations make a difference supporting GER3 to help people recover from Harvey and deliver impactful projects. Thank you for any support you can provide! GER3 launches its first crowdfunding campaign to raise money for its sustainable tree recycling program in Haiti. GER3 is attempting to raise $20,000 in order to extend current operations in the Dame Marie and Abricots communities, as well as expand the program to other developing areas. Follow the Haiti Tree Recycling program on GER3's official Facebook, Instagram and Twitter. GER’s first major project as a new organization (formally launched in January 2017) is the Haiti Tree Recycling Project. GER, in partnership with the communities and United Nations Development Programme (UNDP), is supporting up to 10,000 Haitians affected by Hurricane Matthew with livelihood recovery through a three-month tree recycling pilot project in the Grand’Anse Department (Dame Marie and Abricots). GER is working through an intensive community engagement process to identify the fallen trees that can be recycled into building materials that can then be used in reconstruction. Community members are trained and then work to assist in clearing areas of wood that can be used as timber for rebuilding damaged homes. Income generation and support to small enterprises in the area ensures that there are economic benefits for communities (families and small businesses) engaged in the project. GER launched officially on January 1st 2017. After a year of preparations, we are please to announce that GER is now focused on delivering humanitarian relief, recovery and reconstruction services.